1g gold bars are versatile and affordable – and one of our most popular products at CoinInvest. Gold 1g bars are a good choice for those new to the exciting world of precious metals as well as a convenient option for established buyers. Gold 1g bars make great gifts, too – buy them for younger investors or to mark special occasions like anniversaries, christenings, bar mitzvah’s or birthdays. We always have a varied selection of 1g gold bars manufactured by LBMA approved refiners for you to choose from. These versatile gold bars are VAT Free if you’re based in EU countries and each contains exactly 1 gram of fine 24 carat gold. 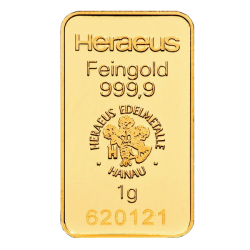 Shop for 1g gold bars from leading brands like Heraeus and The Perth Mint.